United Methodist Women member Dorothy Ravenhorst was proud when her Virginia Conference Woman’s Society of Christian Service adopted the Charter for Racial Justice in midst of the Civil Rights Movement. “It was during this turbulent time in May 1965 that our conference president, Margaret (Peg) Tyrrell, decided to bring the Charter for Racial Justice forward to our Virginia annual meeting. She took a great risk trying to get it adopted at this time when so many were divided about segregation and integrated schools in Virginia. … Knowing that the presiding officer could not speak for or against an issue on the floor, Peg stepped down, handing her duties to the vice president in order to present the charter herself. “There were over 1,300 present at the meeting, including guests and visitors, but only 439 voting delegates. Peg made a persuasive and passionate presentation using her best theology. … After much discussion, the vote was taken and it carried by more than two-thirds. 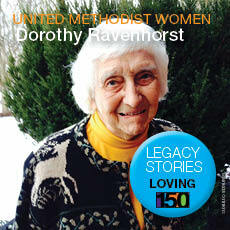 Dorothy Ravenhorst served as a director of United Methodist Women’s national policymaking body from 1988-1992, representing the organization in the anti-apartheid South African divestment work through the Interfaith Center for Corporate Responsibility.